Sometimes, waking up is the most difficult thing to do: if you’re like me, the snooze button on your iPhone’s alarm clock gets far more love than the OK button. But we have lives to slip back into, so eventually we all tumble out of bed, most of us grumbling and wishing we could have just one more minute to gain some strength. In its debut, If You Leave, folk-rock group Daughter’s eventual awakening is hard-fought and hard-won, but in its grip, burying yourself into the sheets proves to be an incredibly tempting offer. At the crossroads of two pools of musical influence, the band finds a sweet spot between the intimacy of acoustic folk acts and the rousing power of indie-rock: intimate production, a reserved but powerful vocal performance from Elena Tonra, and sparse but layered instrumentation are the main weapons in its arsenal. A cursory listen to opener “Winter” would make this self-evident. Say hello to slow, pulsating rhythms, harmonies so slight they’re hardly echoes, and drums firing like cannons from a distant hillside. “Smother” begins with just guitars and piano and stays there, and just when Tonra reaches the track’s climax with an apology, rasping “I’m sorry if I smothered you,” the bottom of the track falls out, putting the focus on her raw, expressive voice—the band knows how to use its assets to yield stunning results. Behind its sadsack nature, If You Leave also packs some surprising muscle, particularly when it comes to the percussion. Album single “Youth” throws us for a loop by beginning with the band’s typical sparse guitar-led instrumentation before bursting into a gallop in the chorus with help from the thundering toms. It sounds like youth, alright (albeit filtered through Daughter’s sepia-toned lenses), bold and cynical but tinged with sprouts of understanding and acceptance, and the band shows a thematic and musical maturity impressive for a debut. As dark as these ten tracks are, they’re also quite beautiful—the band has built a haunting world easy to lose yourself in. Unfortunately, therein lies the rub: sometimes the band can’t find its way out, either. You really have to think about that Shel Silverstein poem about the girl afraid of drowning: locked in her room, she ultimately drowns in her own tears. Both “Still” and “Lifeforms” suffer from this issue, both slogging through delicate but dreary soundscapes without a hint of light or resolution. Because this is Daughter, the music is still grandly atmospheric, but once the fog rises, there’s not much left for us to take away from it. 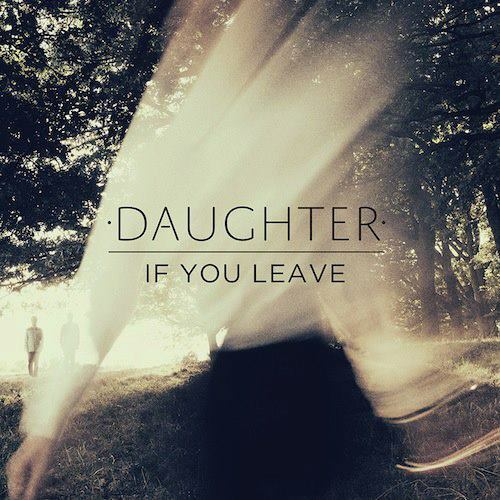 But this daughter is stronger than she lets on: after If You Leave hits emotional rock bottom at the end of its first act, it rallies in its second half, hitting peak after peak. “Tomorrow” uses intricate rhythms and a classic build to create dread, but there’s a charming hint of levity with the folksy background vocals. After it cracks the album’s shell, “Human” absolutely shatters it: the drums are rarely prominent as they are here, giving this track an admirable drive—and Tonra the strength to assert herself: “Underneath this skin there’s a human / Buried deep within there’s a human,” she declares in a rare moment of triumph. The band doesn’t lose the melancholy here, but it grows a backbone to go with it. By the time “Shallows” wraps up the album, there’s been a paradigm shift: gone is the sense of helplessness and in its place, a sturdy sense of faith settles. “If you leave when I go, find me in the shallows,” Tonra breathes, and though the moment is a departure, in another sense it’s a new beginning, heralded by the toms swelling over the chorus. If You Leave may be the soundtrack to an aftermath, but it still sounds like the beginning of a new era—and the band behind it clearly has the chops to make its wildest dreams real.